Learning to read begins in early infancy. By reading to your baby everyday parents begin to instil a love of language and reading while simultaneously providing physical and emotional stimulation that leads to positive bonding and attachment. The Ministry of Education ELECT Curriculum Framework, used daily by the teachers at the Prosserman JCC Daycare and Preschool in their program planning, outlines how the imitation and repetition leads to the ability to pretend and imagine, two skills important for early literacy. As children become more verbal, parents are encouraged to engage children in conversation with open-ended questions and responsive statements, rather than reading books cover-to-cover. This interaction can enhance a child’s understanding of and ability to use language, ultimately leading to reading comprehension. (2) For example, ask “What do you think is going to happen next?” Then, stop to identify elements in the pictures that provide food for thought. Provide your child with real world experiences that show them that letters and words are all around. 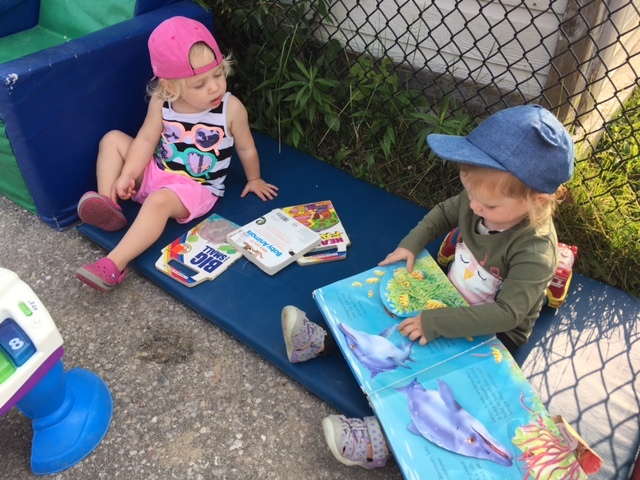 Look for opportunities to teach letters and words by playing with letter blocks, sharing books to look at independently, singing songs and labelling items. Make reading a habit. Read every day as part of the daily routine as well as something that happens spontaneously. Above all, make it fun! Use funny voices, sing songs, encourage your toddler or preschooler to tell you the story. Make stories up with your child and write them down together. This is a great way for your child to make literacy connections between reading and writing. Learning to read is not all about phonics anymore. Learning to read is a balance of learning letters and learning sounds. It’s about taking the time to expose your children to books, letters and sounds and to encourage them to develop a love of reading that will help them gain the skills needed to become a lifelong reader.